With Steam's Early Access program nearing the end of its third year, the Xbox One Preview program half way through its first, and other platforms and distributors gearing up to follow suit, the term "Early Access" is starting to mean different things to different people: perhaps it's time to review what we expect from games released before they are finished? When I started Payload Studios in 2013, our vision was to develop TerraTech using a community-driven approach, following in the footsteps of games like Minecraft by releasing early and updating often, evolving by constant interaction with players over a long period. We Kickstarted the following summer, launched a beta preview on the Humble Store that November and released into Steam Early Access in February 2015. We put a huge amount of work into engaging with our community, and they repay us a hundredfold with their support and devotion. I have always seen Early Access as formalisation of this approach. With this model, it's acceptable, in the early stages, not to have a precise vision of the final product. A much lower level of polish and stability, compared to the expected standard of a finished game, is also allowed. However, acceptance of these things comes at a price: constant communication with players, responding to their concerns, acknowledging their input and frequently updating the game. Recently, I've noticed a different paradigm of Early Access beginning to take root: more of an 'open beta' model, where you mostly finish your game and then release it in a (typically shorter) tuning & polish phase, in which you don't make major gameplay additions or direction changes, but gather player data to balance and iron out wrinkles. The former, Minecraft-style model is pretty much what Steam's Early Access FAQ describes, and I personally echo their sentiment "this is the way games should be made". I'm not sure when the second paradigm started to gain traction, but it's becoming popular with developers as well as players - perhaps as a reaction to perceptions of poor quality in Early Access games. For example, in this article from last month, the developer of Ark: Survival Evolved advocates the 'open beta' style, even suggesting that developers who rely on Early Access revenue to finish their games are putting the whole program at risk. While I dispute that conclusion (read my argument in the comments, if you're interested), I do agree it's a risky idea to launch a game without a plan for how to finish it. But if you sent that piece of advice back in time to Mojang circa 2009, we might not have Minecraft today, and by extension the whole Early Access program. Earlier last year I read an interesting piece advocating a whole new label for games that plan to grow, long term, after release. I don't know if "Living Games" quite hits the mark, but there's clearly a need to manage expectations better. In fact, I think this is the crux of the whole issue: it's our job, as developers and publishers, to communicate with players, so they know what they are buying into. It seems to me that to redefine Early Access, or to invent new labels, is to miss the point: better communication is what's needed. Community has been the favourite buzzword of the industry for the last year or two. At every scale from AAA leviathans to indie tiddlers, developers want to build communities, and so they should: an engaged and supportive community is an incredible asset, which will carry you through thick and thin. Building a community like this is deceptively simple (deceptive because simple does not mean easy): have a fun game, provide ways for players to connect and express themselves within/around/about the game, communicate with them and update frequently. There's more to it, of course, but that's the core, and the communication part is notoriously difficult to get right - but it's the part that developers need to master in order to make Early Access work; whichever definition you choose. Obviously you need to tell your players what you're doing, and hear what they have to say about that (and everything else). Obviously you need to factor this input into development, and let them see you doing that. But also, you need to avoid letting the tail wag the dog. The games community is full of loud opinions, and even non-anonymous channels like the Steam forums attract some strident viewpoints. It's easy to succumb to negativity bias, so remember: the loud and passionate minority does not necessarily represent your whole community, or your target audience for that matter. The guy who absolutely hates that last design change is much more likely to comment than any of the thousands who are fine with it. Don't base your development strategy on vitriolic comments without getting some data to back that up. I saw a great GDC talk some years ago by Ben Cousins, who illustrated this point with examples from Battlefield Heroes. After some design changes affecting the virtual currency economy, they encountered a seemingly huge backlash, spawning fairly hysterical headlines on sites like Kotaku and Ars Technica. But they looked at the data and saw that, not only were the changes working well, but the people complaining loudest about "pay to win" mechanics were among the heaviest users of those mechanics. And despite predictions that the game was doomed, the userbase actually grew in response. We saw something similar at work with TerraTech's 'R&D Pack' DLC. By way of background, understand that a bunch of people just hate DLC on principle, believing that developers cynically hold back content in order to charge extra. Others view Early Access with automatic suspicion, and claim it's fundamentally dishonest to ask money for something unfinished. Combine those two ideas, and retreat to a safe distance! Though TerraTech was always conceived as a community-driven development, some of our ideas we thought were a bit too hairy for the Steam community - or at least for the whole community. We came up with the idea of a 'deeper access pass' for players who really want to see the nuts and bolts of the game being made. This became our R&D Pack: an optional extra, for people who want to play with in-development content in an unbalanced and possibly broken state, and give detailed feedback. It's a paid add-on, to keep the participation and feedback to a manageable level, and it was priced in order to appeal to a minority of super keen players - we didn't expect to make a lot of money from it. On advice from Valve we used the DLC mechanism to implement this paid add-on, though it isn't DLC in the normal sense, because the affected content is only temporarily exclusive (it's all coming to the main game, in time). You're paying for a rolling content preview plus deeper developer access. Unsurprisingly, with hindsight, this distinction was lost on the Steam forum users who flamed us for weeks about it. Some seemed almost gleeful in their rage about this apparently indefensible practice: "Day-1 DLC" in an Early Access game. Luckily we looked at the numbers before panicking and saw our attach rate was over 30 percent. 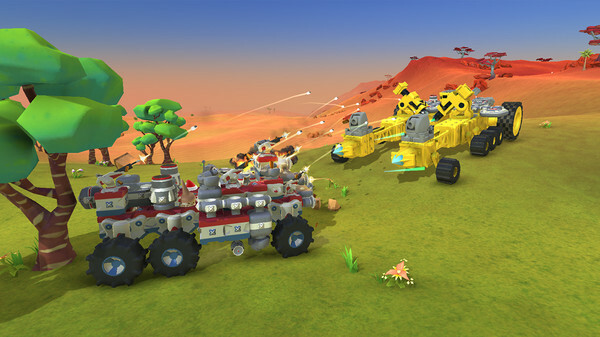 As of now, with TerraTech unit sales well past the 100,000 threshold, 40 percent of players have paid for the R&D Pack, either as an add-on or bundled with the game. None of those angry commenters had actually bought the add-on and been disappointed - most hadn't even bought the game. When we talk to our actual players, those that buy the R&D Pack are, overwhelmingly, happy with it. Community-driven development means communicating with players and observing what they do, then responding thoughtfully - not reacting reflexively to every bit of blowback. When I hear people wanting to redefine Early Access in response to negative perceptions, I worry that we're letting the tail wag the dog. There will always be people who don't like the idea of buying unfinished games, but we don't need to win them over, because there are plenty more that do. In the end, it doesn't matter what we call it (and it will end up getting called something different on each platform) - the model of releasing unfinished games will carry on just fine as long as we keep talking to our players. Respect your community and they will treat you well. Russ Clarke is the studio director of TerraTech developer Payload Studios. Over 18 years in the industry, he has worked on IPs like Call of Duty, Fable, Resident Evil, and Metal Gear Solid. He founded Payload studios in November of 2013. "Early Access" has had its share of birthing pains and as this piece highlights, the definition of what it should or shouldn't be is in constant flux as developers attempt their own strategy. What needs to be made clear is that games thrive in the modern climate if they are offered as a service and not a boxed product. The service model is what makes Steam such an exciting platform, and as we see in the ridiculous success of similar models across other entertainment mediums, will eventually become so accepted that people literally cannot remember why they were angry. Though there's work to do. The "Season Pass" monicker is so brazenly trying to hurry up this process, but the numbers show that it's more than working. The day people see games as another service that slots comfortably into their lives will go uncelebrated, because it's already happened and real artistry is thriving once more. Only this time, you get the magic of user testing, feedback, communities and creative evolution of that which was once set in stone. Ace. Communities are beyond excellent when compared to the vitriol of, say, ten years ago when people became convinced that developers earning money is the worst thing for the industry ever. I think you've identified some of the major hazards developers will face using early access and anyone thinking of doing it would benefit from this perspective. Regarding how early access should be viewed, I am not sure I feel it's as black & white as you lay out. I think approaches like the "open beta," using your words, work for different reasons on different projects. The main issue with releasing something too soon, is that there is a rating system associated with early access. And as you point out, people that are often happy are less likely to make a comment, and possibly even rate a game, as the people that feel let down or betrayed by their purchase - those reviews follow you out of early access. I think you might underestimate the impact negativity can have if your game is not as solid as it will be, you don't have the resources to be as agile in response to the feedback, or you simply have a different vision you're working toward and you really believe in it. Anyway, good stuff, I guess I just feel there isn't a right or wrong way to do this; it's really a question for each individual developer, to decide based on their culture and capabilities. If they feel they can utilize early access for the betterment of their product and its community by using one approach over another, I think either one can be valid. Thanks Jens - yes, it's true that negative reactions can have long-term consequences without a prompt and measured response. I guess my message is that developers have it in their power to overcome criticism, by communicating well. There's nothing wrong with the model, provided we remember this. You're quite right that the open beta approach is completely valid, and may be the best choice for some projects. I think devs should just go back to calling "Early Access" what it used to be called: a DEMO/Work in Progress game that's not quite cooked, let users know up front that if they like what they play they'll be helping fund the rest of the process and stay honest when you post updates about progress towards the finished game. Ignore the haters who show no hours played (or play a few minutes, find a bug that's been reported a hundred times that's getting fixed but still complain the game is "bad") and keep pushing for final code that's as bug-free as possible. I have a bunch of Early Access games in my account I haven't touched in months because I've played enough to like them, but updates have been either too slow that I don't need to replay through the same bugs or so frequent that my save files won't work with the updates (or in one case, get wiped out entirely). In those cases, I shift those games to the bottom of my backlog and only check in when they're ready for their close up. I do like the updates on Early Access games, as mentioned it gives you a reason to go back and play them again. Just be honest and transparent as a developer and you can't go wrong. Early Access is a great place to get community feedback and support whilst finishing your game.